Also included is a bonus CD with five appendices that provide a number of practical details to assist in the success of your QRM implementation. When you are ready to start implementing QRM, you will find that these appendices contain time-saving tips to help you work through implementation issues―including simple calculation methods and tools to support the design of your QRM strategy. You can also access these Appendices on the Downloads and updates tab on https://www.crcpress.com/9781439805961. The author, Rajan Suri, recently became one of only 10 people to be inducted into Industry Week's 2010 Manufacturing Hall of Fame. Suri's work is refreshingly logical. And for a book having fewer than 200 pages, it's incredibly comprehensive, covering shop floor part flow; the front office; engineering; new-product development; scheduling; supplier strategies; and even basic accounting issues, including an insightful discussion of how a shop allocates overhead and the effect it has on shop operations. Most refreshing of all, not once does Suri mention anything about 'doing more with less.' Under QRM, if demand rises, companies should indeed invest in machines and people to build in that excess capacity and ensure utilization doesn't head into dangerously high territory. QRM does demand that workers perform myriad functions, set up more often, and manage product flow. But it doesn't demand that they put in long hours to get the job done. During a time when so many companies are reluctant to add to their payrolls, that's a powerful message. Rajan Suri is Emeritus Professor of Industrial Engineering at the University of Wisconsin–Madison. He received his Bachelors degree from Cambridge University (England) in 1974, and his M.S. and Ph.D. from Harvard University in 1978. Dr. Suri founded and served as Director of the Center for Quick Response Manufacturing (QRM) from 1993 to 2008, and continues to serve the Center in an advisory role. The Center is a consortium of companies working with the University on developing and implementing QRM strategies—over 200 companies have worked with and supported the activities of the Center (www.qrmcenter.org). 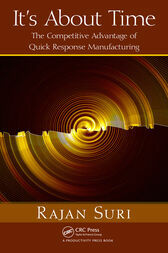 Suri introduced the core concepts of QRM in his landmark book Quick Response Manufacturing: A Companywide Approach to Reducing Lead Times (Productivity Press 1998). He is also author of over 100 technical publications, has chaired several international conferences on manufacturing systems, and has served on the editorial boards of leading scholarly journals in the field. Dr. Suri combines his academic credentials with considerable practical experience. He has consulted for leading firms including 3M, Alcoa, AT&T, Danfoss, Ford, Hewlett Packard, Hitachi, IBM, Ingersoll, John Deere, National Oilwell Varco, P&H Mining Equipment, Pratt & Whitney, Rockwell Automation, Siemens and TREK Bicycle. Consulting assignments in Europe and the Far East, along with projects for the World Bank, have given him a substantial international perspective on manufacturing competitiveness. In 1981, Dr. Suri received the Eckman Award from the American Automatic Control Council for outstanding contributions in his field. He was a member of the team that received the 1988 LEAD Award from the Society of Manufacturing Engineers. He is coauthor of a paper that won the 1990 Outstanding Simulation Publication Award from The Institute of Management Sciences. In 1994, he was co-recipient of the IEEE Control Systems Technology Award. In 1999, Suri was made a Fellow of the Society of Manufacturing Engineers (SME), and in 2006, he received SME’s Albert M. Sargent Progress Award for the creation and implementation of the Quick Response Manufacturing philosophy. Rajan Suri recently became one of only 10 people to be inducted into Industry Week's 2010 Manufacturing Hall of Fame.